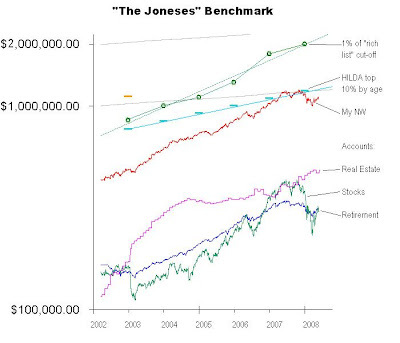 Apart from the more conventional Asset Class benchmarking I discussed in previous posts, I also compare my total net worth with comparable peer groups (the "Joneses"). The graph below shows my total net worth (and the stock, real estate and retirement components) over the past six years, and compares it to two relevant peer groups. The first is the "top decile" (10%) of net worth for Australian's my age (based on the 2002 HILDA national survey results, adjusted for age effects and assumed inflation of 4%pa). By this comparison I'm doing quite well, slowly moving past the top 10% of individual NW and heading towards the top 10% "household" value. I think it's interesting that although new people regularly make it onto the "rich list" through very rapid wealth creation (often speculative business ventures that come good), and other's drop off it just as suddenly (when their business empire collapses), taken as a group the wealth of these "super-rich" increases at a rate typical for a diversified, high-growth asset allocation. What an interesting goal. I know that my husband would love us or the children to get onto the rich list. I am not quite that ambitious. I am happy to have enough passive income to mean that we can be happy and not have to work.